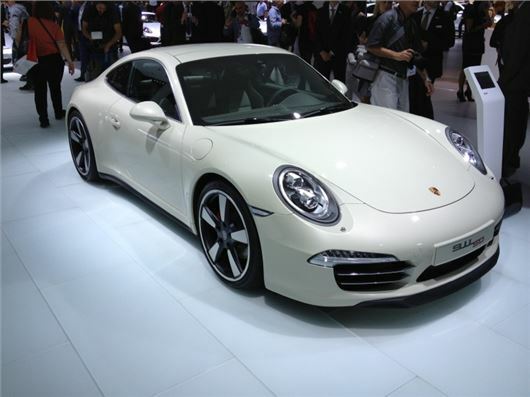 Porsche has paid homage to its iconic 911 at the Frankfurt Motor Show with the launch of the 50 Years Edition. Just 1963 cars will be produced, with prices starting at £92,257. The first right-hand drive deliveries will start from the middle of September. Based on the Carrera 4/4S, the 50 Years Edition gets the wider body of the Carrera 4 models plus the Porsche Active Suspension Management system that has been tuned specifically for the wider rear track. The rear-wheel drive sports car also gets a sports exhaust, bespoke chrome strips on the fins of the engine top and a strip between the rear lights. The special five-spoke 20-inch alloy wheels are based on the classic Fuchs design and come in a matt black finish with polished centres. Two unique colours are available for the 50 Years Edition - a darker Graphite Grey and a lighter Geyser Grey metallic. Every car gets a special '911 50' badge on the rear lid which is then repeated on the headrests, door sills and instrument dials, which incidentally also get green labelling and white needles. Power comes via a 400PS 3.8-litre flat-six engine and the 911 will hit 60mph from a standstill in less than five seconds. Top speed will be a respectable 186mph, while it will return 30mpg on the combined cycle. Other extras includes high-gloss window frames and SportDesign exterior mirrors while inside the leather seats get centre panels designed with a fabric that echoes the ‘Pepita’ tartan design from the 1960s. The leather interior can be specified in Agate Grey or Black with decorative stitching. Sports seats with 14-way adjustment are standard, with 18-way Sport Seats Plus available as an option. The gear lever comes from the Porsche Exclusive custom tailoring programme.